Quick and easy beef noodle soup recipe, homemade with simple ingredients in 30 minutes on stovetop. A hearty one pot meal, loaded with vegetables, Italian seasoning, egg noodles and leftover pot roast. Typically, this soup would take more than an hour to make because you would have to cook the beef too. However, since you are using cooked meat (e.g. leftover roast), it’s ready in about 30 minutes. 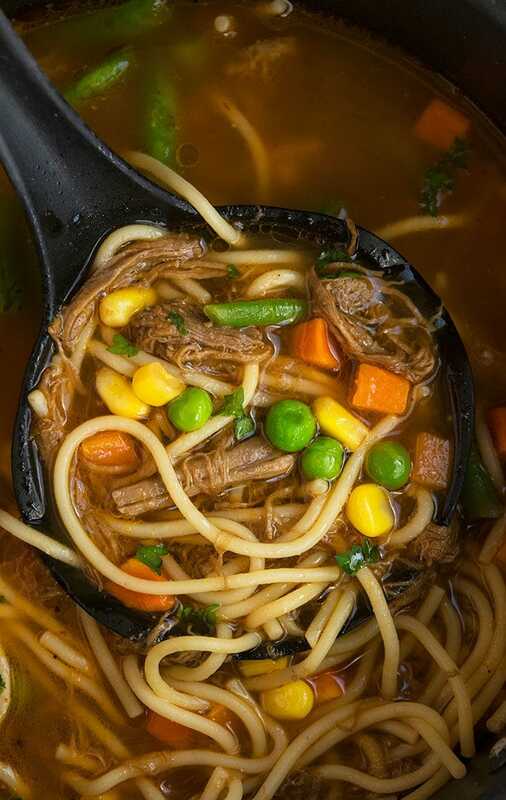 What sides to serve with beef vegetable noodle soup? Typically, this soup is served on its own because it does have egg noodles, which are very filling. However, to make it even more filling, you can serve breadsticks or crusty bread on the side. Garlic bread and cornbread are also good choices. 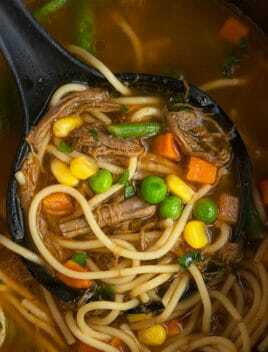 Taiwanese beef noodle soup/ Chinese beef noodle soup– This would be an Asian twist to this recipe. The post roast should be made with Asian herbs, sauces, seasonings rather than Italian seasoning. Spicy beef and noodle soup– Add red chili flakes to give it a spicy kick. Make it creamy– By adding some heavy cream towards the end. This also thickens it slightly and makes it more flavorful. 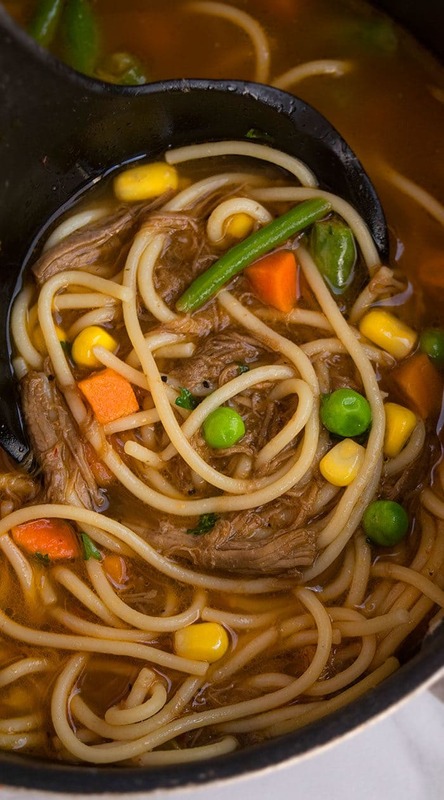 Don’t shred the beef– It makes the soup very messy and “stringy.” I recommend using roughly sliced pieces. Use unsalted butter and low sodium broth– Because it prevents this meal from becoming too salty. What type of noodles to use? Egg noodles taste the best and there are a variety of shapes to choose from. Udon noodles are great too. You can also use thin noodles or small shells. Frozen vegetables vs. Fresh vegetables– I like to use frozen veggies because it’s convenient and they also cook faster. If you use fresh veggies, you would have to add them earlier because they take a little longer to cook and become tender. Adjust amount of vegetables– This is based on your preference. You can add more or less. Adjust herbs and seasonings– This is based on your preference too. I only use a little bit of Italian seasoning since the pot roast will add a lot of flavor. 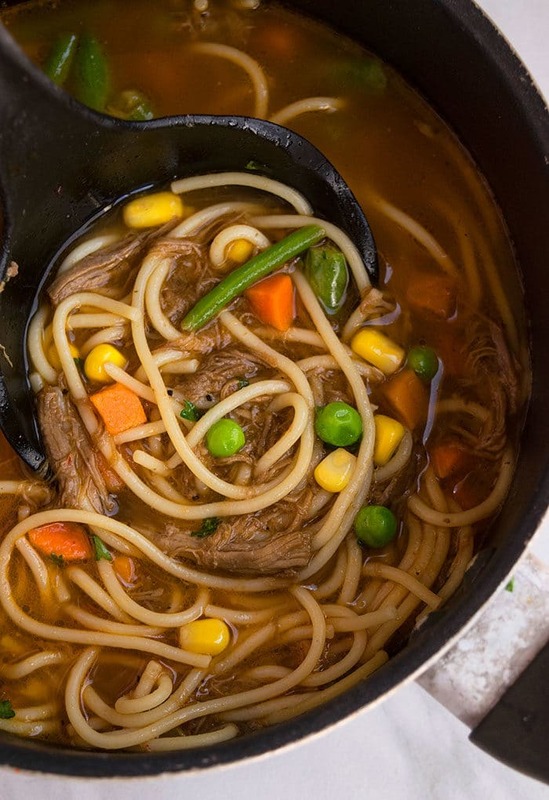 Quick and easy beef noodle soup recipe, made with simple ingredients in 30 minutes on stovetop. A one pot meal, loaded with vegetables and leftover pot roast. Heat butter and oil in a large nonstick pot over medium-high heat. Add onions, garlic and saute until fragrant. Add broth, Italian seasoning, salt, pepper and bring to a boil. Add cooked beef and cook uncovered for 10 minutes. Add noodles, frozen vegetables, celery and bring to a boil. Continue cooking uncovered until noodles are cooked through. Garnish with parsley, if you like. Enjoy! Tastes best when served immediately but leftovers can be stored in a sealed container in the fridge for 24 hours. Please note than the texture of noodles will change and become “mushy” because they will absorb a lot of the broth.